I started out by ordering the Nasi Kerabu Ayam Berempah because I really wanted to have something with blue rice, because apparently that’s what the “kerabu” means. 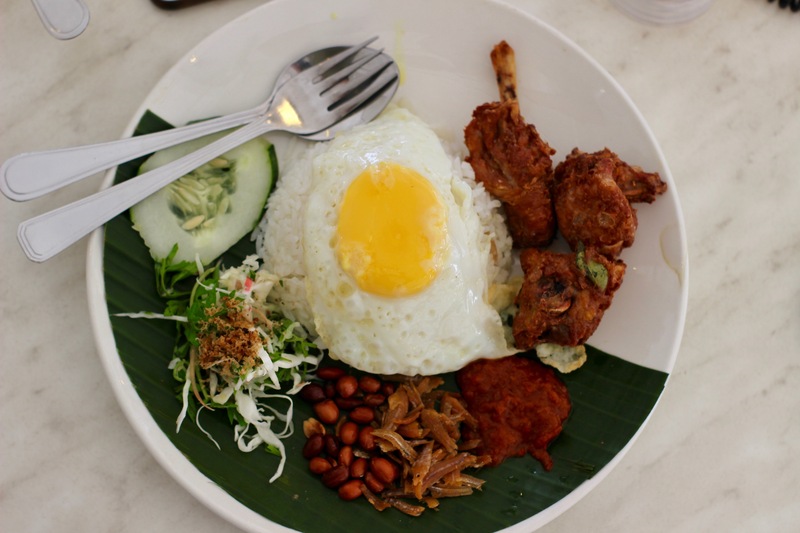 Unfortunately, all the blue was already eaten that day, so I got the Nasi Lemak Aram Berempah instead. I had expected it to come out wrapped in a banana leaf, but instead it was more of a deconstructed nasi lemak and it was beautiful. The egg was nicely cooked, there were peanuts, and the rice was tasty. And of course, aside from the chicken, everything else was extraneous. So let’s talk about that chicken for a minute, shall we? It may have been a little on the dry side, but it was super delicious. And, I mean, moist fried food is probably simply not the style here so my American lens is actually very accepting of the dryness. It’s a little harder to accept, though, that there just wasn’t enough of the chicken. I looked longingly at my wife’s beef dish, which seemed to have more meat to it, and no one wants to do that. Alas, it was still a mighty delicious meal and represented a nice break from the hustle bustle of the rest of Sandakan.